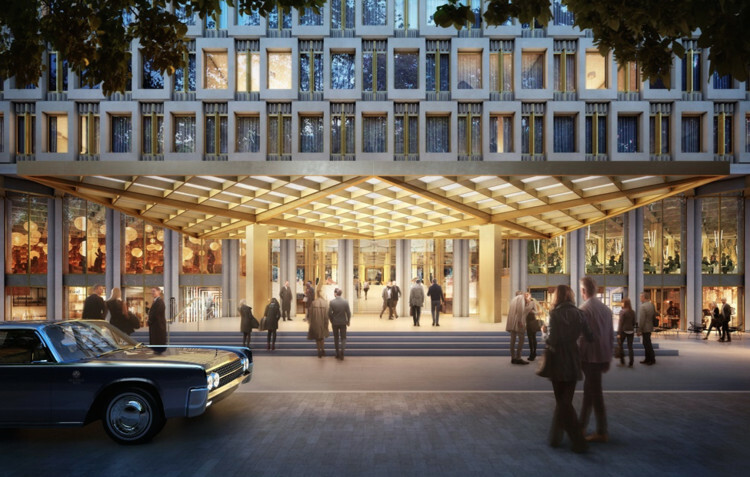 Following a thorough consultation process with the world’s leading hotel operators, Qatari Diar today announced the appointment of Rosewood Hotels & Resorts as the operator for its newly commissioned hotel located on Grosvenor Square, Mayfair within the iconic U.S. Embassy building. The selection follows a long and detailed undertaking involving several other world renowned hotel operators, who each put forward similarly inspiring proposals. In the end, it was felt Rosewood Hotels & Resorts would be the best partner to take Qatari Diar’s vision forward and to revive the renowned mid-20th century listed building, reimagining the space and delivering a destination set to become the heart of Mayfair. Over the coming months Qatari Diar will work closely with Rosewood Hotels & Resorts on the final design, to deliver this ambitious world-class hotel, retail and event space, ahead of the Embassy staff moving into their new home in Nine Elms later this year. 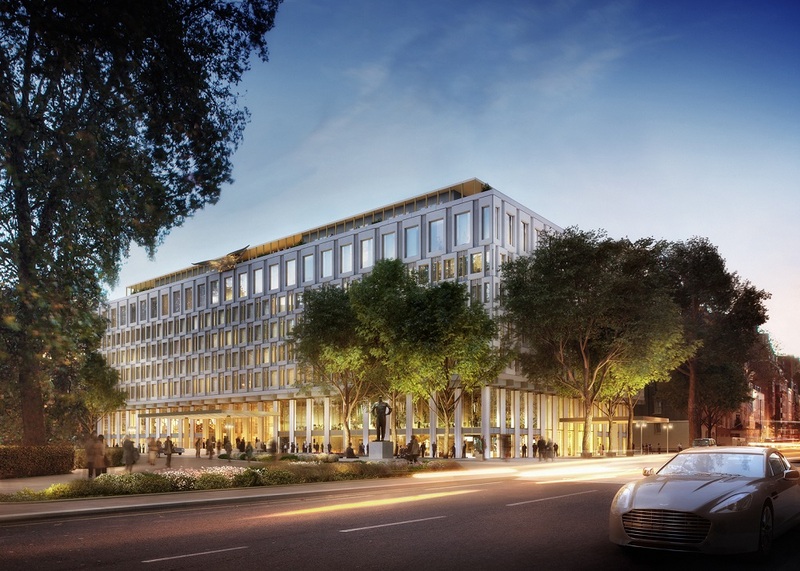 Sheikh Jassim Al-Thani, Chief Development Officer, Qatari Diar Europe & Americas, said: “We are delighted to welcome Rosewood Hotels & Resorts on-board with this exciting re-development of the U.S. Embassy building. This is a major opportunity for London and a hotel of this exceptional calibre perfectly aligns with our vision and ambition to renew the heart of Mayfair and cement the neighbourhood’s unique character as the leading hospitality, arts and luxury retail quarter in London for residents and visitors to enjoy. 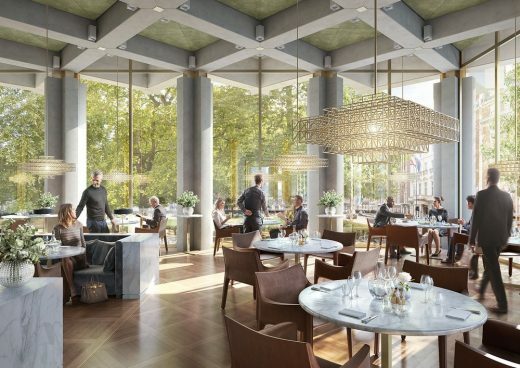 “Rosewood is honoured to partner with Qatari Diar on this extraordinary hotel project in London’s prestigious Mayfair neighborhood” said Sonia Cheng, Chief Executive Officer, Rosewood Hotel Group. Hotel entry, note the amusing ‘contextual throwback’ car! Qatari Diar last year announced the appointment of prominent British architect, Sir David Chipperfield, as the lead architect on the project, who was commissioned to breathe new life into the Grade II listed building. Reimagined in the spirit of its pioneering architect Eero Saarinen, the new design retains the unique external façade, while the refined interiors will present a perfect setting for the landmark mixed-use development. The approved proposal includes 137 guest rooms, five restaurants, six flagship retail units, a spa and a ballroom with space for 1,000 guests, and as such will create many new job opportunities for London. Plans for the site also include significant enhancements to Grosvenor Square which will restore permeability to the neighbourhood, removing the existing security bollards and barricades to provide additional pedestrian walkways. Working alongside the Grosvenor Estate, these works will support Qatari Diar’s further public realm improvements to restore Grosvenor Square as an open, expansive green space fitting for one of London’s most prominent and established gardens. Developer: Qatari Diar – purchased site following decision in 2013 by the United States Government to relocate the Embassy to Nine Elms in Battersea, which will happen in 2017. 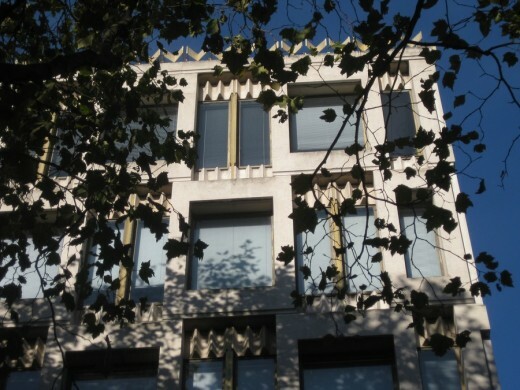 Qatari Diar’s European operation is based in London, and boasts several key local projects, including a landmark residential development at the 12 acre Chelsea Barracks site in Belgravia; Southbank Place, a mixed-use joint venture between Qatari Diar and Canary Wharf Group situated in a prime central London location on the south bank of the River Thames; the current US Embassy in London, which will become a luxury hotel, retail and event space; and East Village & Elephant Park, a joint venture with Delancey and APG, offering more than 4000 private residential apartments for rent. Rosewood Hotels & Resorts® manages 20 one-of-a-kind luxury properties in 11 countries, with 15 new hotels under development. Each Rosewood hotel embraces the brand’s A Sense of Place® philosophy to reflect the individual location’s history, culture and sensibilities. The Rosewood collection includes some of the world’s most legendary hotels and resorts, including The Carlyle, A Rosewood Hotel in New York, Rosewood Mansion on Turtle Creek in Dallas and Hôtel de Crillon, A Rosewood Hotel in Paris, as well as new classics such as Rosewood Beijing. Rosewood Hotels & Resorts targets to double its number of hotels in operation by 2020. 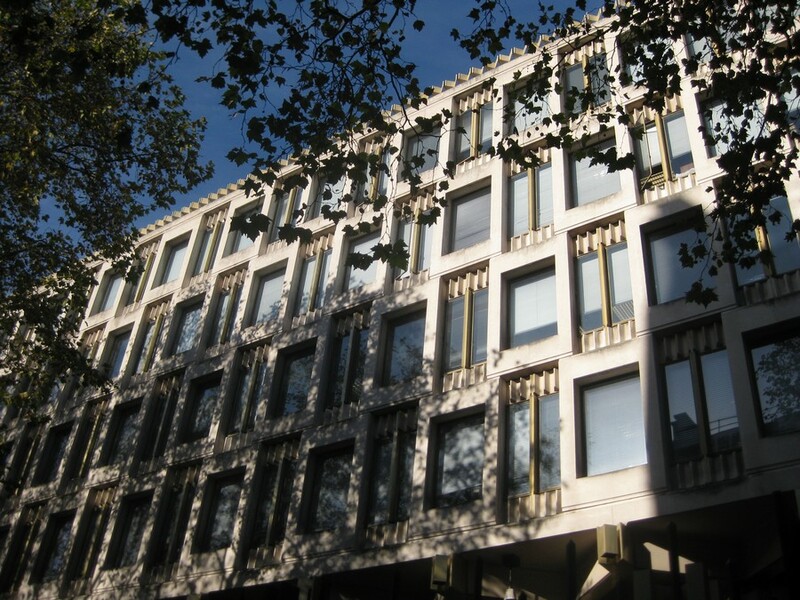 5th April 2016 – David Chipperfield Architects has revealed plans to convert the current landmark US Embassy in Grosvenor Square into a luxury hotel, reports Building Design. 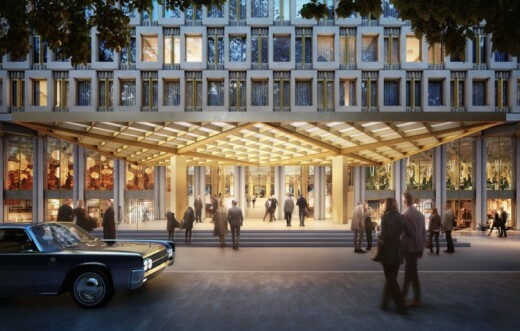 Chipperfield has beaten off competition from Foster & Partners and KPF to land a role on the £1bn redevelopment of the grade II-listed embassy, which is due to be vacated by the US government later this year when it moves to the purpose-built facility in Nine Elms. The 137-bed five-star hotel will include a ballroom capable of hosting 1,000 guests as well as a spa, five restaurants and a number of high-end retailers. Plans are due to be submitted to Westminster Council next month. The hotel redevelopment will also see a number of the security measures put in place to protect the current embassy (after the 9/11 attack) removed. Will the prominent US eagle will remain on the facade? Exhibition on proposals from 11 to 16 April at 11 Grosvenor Hill, W1K 3QB, from 3 to 7pm except the Satuday, 11am – 2pm. Qatari Diar will shortly be submitting an application to Westminster City Council for the redevelopment of 30 Grosvenor Square. This strong and reposed design by famous 20th Century architect Eero Saarinen has been given Grade II status (ie not the top ranking) by UK Architecture minister Margaret Hodge. The rhythmic facades were picked out for special mention. – the architect died in the year it was completed. The four competing architectural firms KieranTimberlake, Morphosis Architects, Pei Cobb Freed & Partners, and Richard Meier & Partners worked for nearly a year and made presentations to the jury which then recommended the winning design.